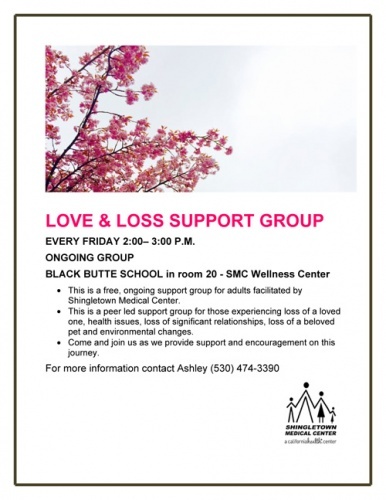 The Shingletown Medical Center sponsors a Love & Loss Support Group every Friday from 2:00 pm to 3:00 pm at the Shingletown Medical Center Wellness Center located at Black Butte School in Room 20. This is a free, ongoing, support group for adults facilitated by the Shingletown Medical Center. This is a peer led support group for those experiencing loss of a loved one, health issues, loss of significant relationships, loss of a beloved pet or environmental changes. You are invited to join them as they provide support and encouragement on this journey. 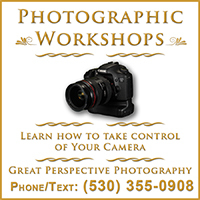 For further information, please contact Ashley at (530) 474-3390.